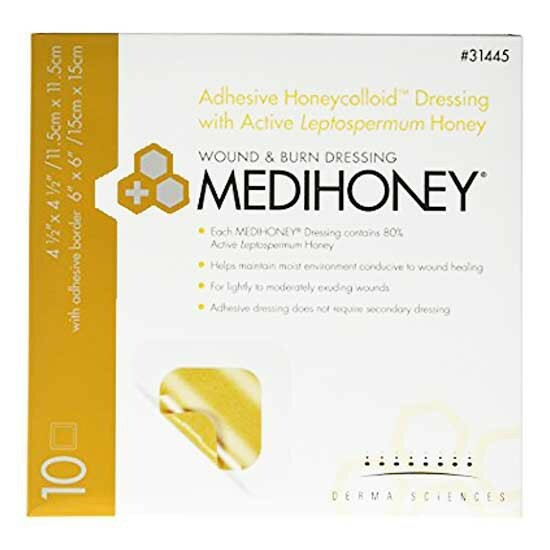 Medihoney HoneyColloid is a leptospermum hydrocolloid dressing manufactured by Derma Sciences for treating lightly draining pressure ulcers, skin tears, and to cover or fill a partial to full thickness wound. 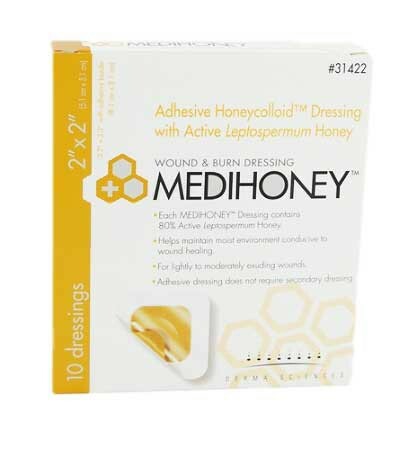 Two versions of the Medihoney Hydrocolloid Dressings are available—Medihoney Adhesive Dressing designed for pressure ulcers and skin tears and the Medihoney Non-Adhesive Dressing designed for covering or filling a partial to full thickness wound. Both versions absorb light to moderate amounts of exudates. 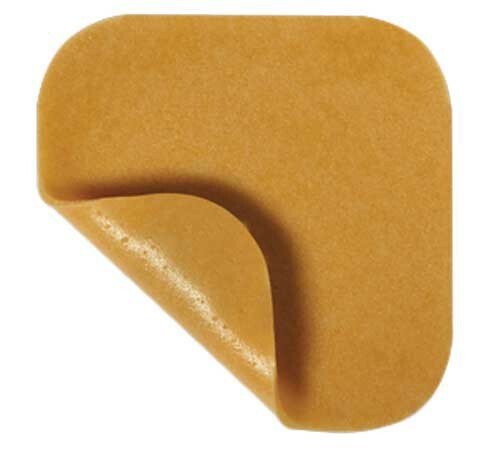 The Honeycolloid pad will form a gel as it warms up from body temperature and as it comes into contact with wound fluid. 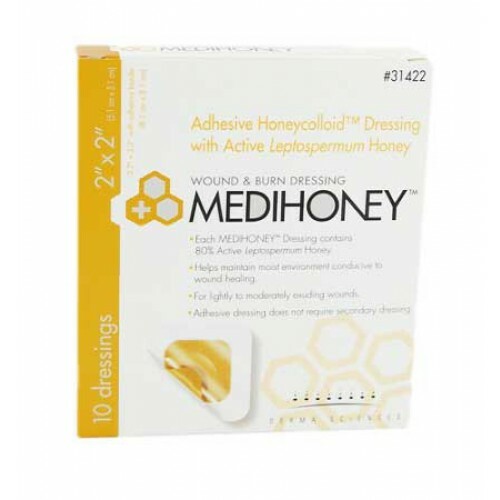 Give Medihoney a try! Just click the following link to request a FREE SAMPLE of Medihoney. Medihoney is honey derived from the pollen and nectar of a specific Leptospermum species of plant in New Zealand and Australia. Leptospermum is unique among all types of honey in that it maintains its effectiveness as a Wound Dressing even in the presence of wound fluid. Leptospermum is the only species of honey that has been shown in randomized controlled studies to help wounds that have stalled under first-line treatment to progress towards healing. Cleanses and debrides due to its high osmolarity. Helps to lower overall wound pH. 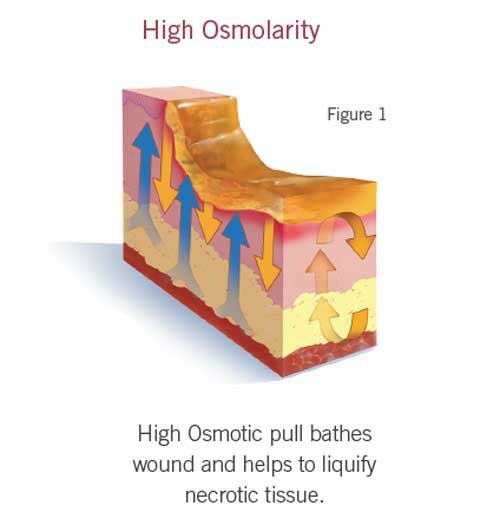 Promotes a moisture-balanced environment conducive to wound healing. Easy-to-use, with the potential for extended wear times (depending on level of exudate). Effective for treating diabetic ulcers, venous stasis ulcers, arterial ulcers, leg ulcers, pressure ulcers, 1st and 2nd degree burns, donor sites, traumatic wounds, and surgical wounds. Effective in all stages of wound healing. Product Numbers: 31222, 31245, 31422, 31445. 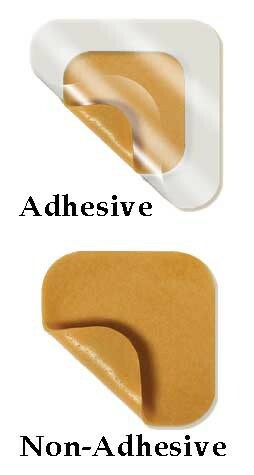 Adhesive Dressings (occlusive, thin film backing and adhesive border): 31422, 31445. 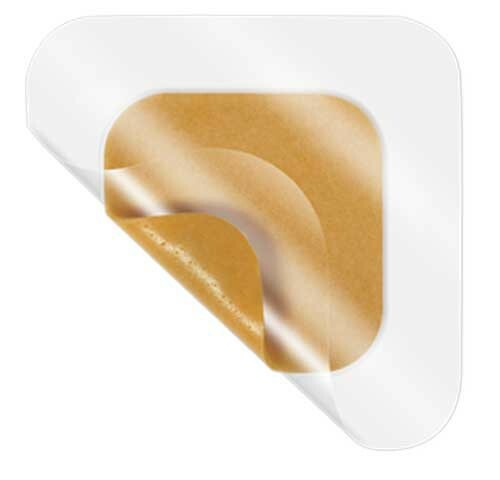 Non-Adhesive Dressings (not occlusive, requires a secondary dressing to hold in place): 31222, 31245. 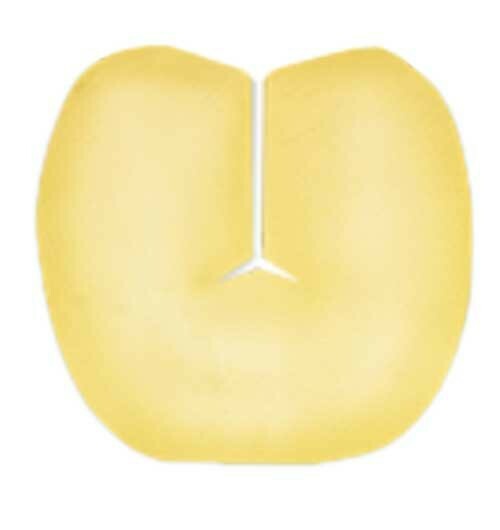 Pad Size Options: 2 x 2 Inch and 4-1/2 x 4-1/2 Inch. Adhesive Border Sizes: 3-1/2 x 3-1/2 Inch and 6 x 6 Inch. 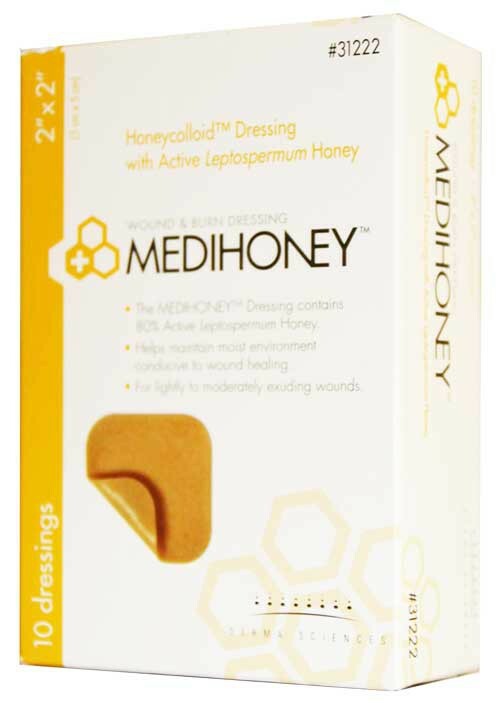 Medihoney Ingredients: 80% Leptospermum Honey. HCPCS codes: A6234, A6235, A6237 & A6238. Saikaly, Sami K., and Amor Khachemoune. 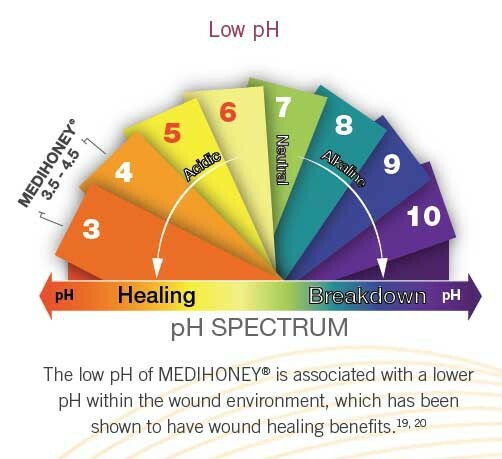 "Honey and wound healing: an update." American journal of clinical dermatology 18, no. 2 (2017): 237-251. Reese, Ann, Deborah Willoughby, Stephanie C. Davis, Toni Silver, and Tad Venn. "Revisiting the Use of Honey for Treating Chronic Wounds." American Journal for Nurse Practitioners 15 (2011). Vandamme, Lynn, Alexander Heyneman, Jozef Hoeksema, Henrick Verbelen, and Stan Monstrey. 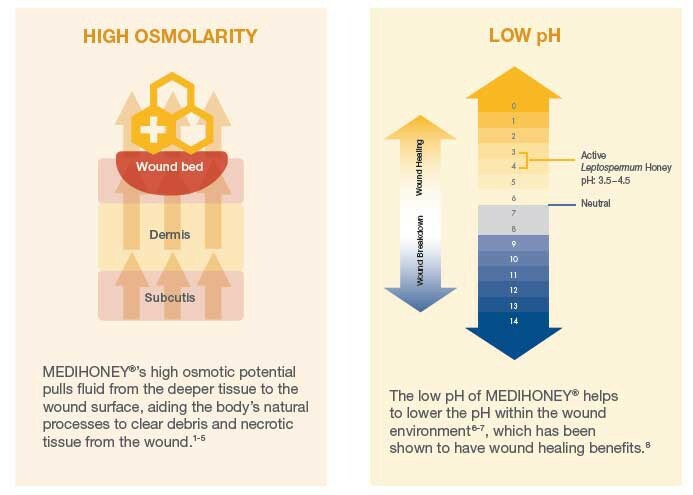 "Honey in modern wound care: a systematic review." Burns 39, no. 8 (2013): 1514-1525. Product Sell Sheet contains selection options for wound care. Debridement Sell Sheet offers features and benefits for product use in wound debridement. 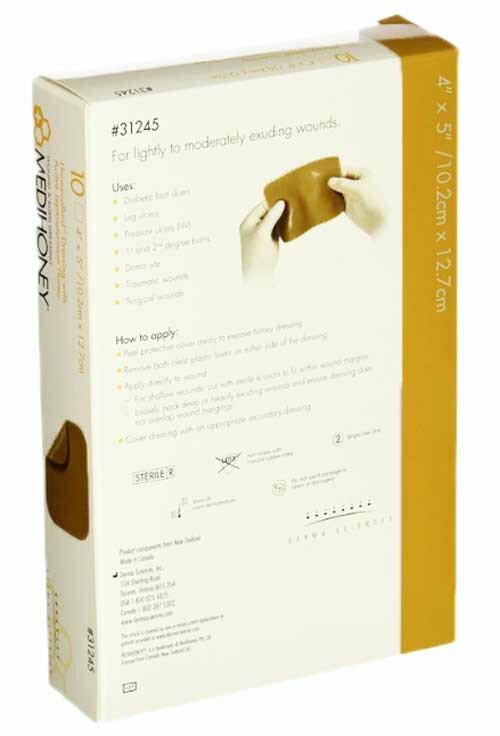 Debridement Treatment contains detailed information for using this product for wound debridement. Palliative Wound Care information for using Leptospermum honey. Patient Guide offers information for patients considering this product for chronic wound care. 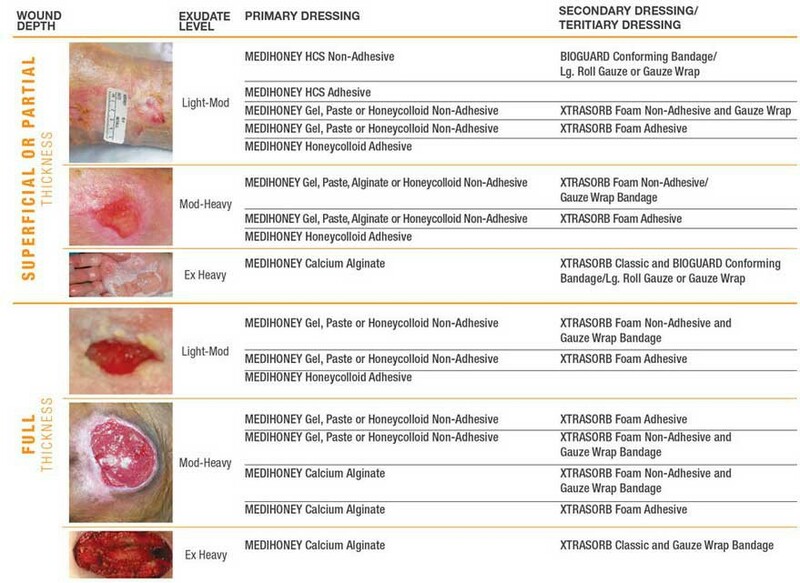 Protocol Guide for using this wound treatment. Burn Care Treatment offers highlights for using this product for the treatment of burns. Are these dressings waterproof? My wound is approximately 2.5 x 2.5. What size wound you recommend? These dressings are not considered waterproof. We cannot make any recommendations regarding items on our site. We recommend speaking with a manufacturer for a proper recommendation.